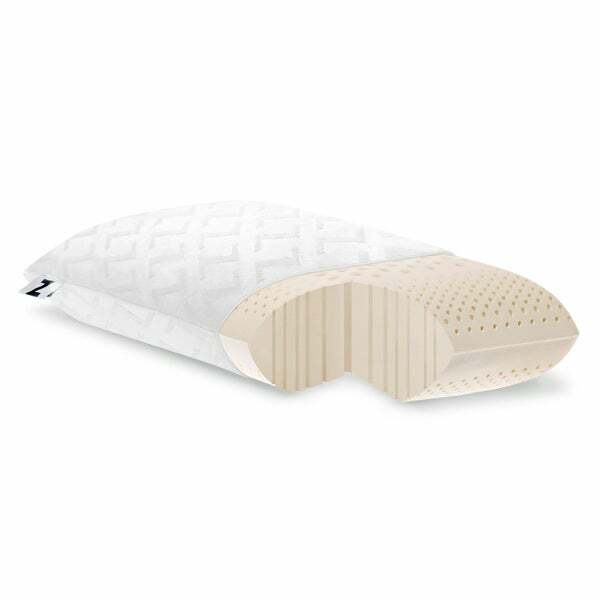 The Talalay Latex zoned pillow from Z by Malouf combines comfort and function with natural latex that conforms to your head and neck for better support. Latex foam maintains its original shape to give you a more resilient-feeling surface to allow you to sleep on top of the foam instead of sinking into it. The large holes in the center cradle the head, while the smaller holes on the perimeter support the neck. This product arrives very tightly packed. Unwrap and allow 48 hours for this product to return to its original shape. I've used foam pillows for many years. Memory foam hurts my ears so they don't work for me. I purchased a foam pillow from BB&amp;B but it was too soft. Found this one and I couldn't be happier. It gives decent support without being too stiff. My neck is much less stressed. I don't need to sleep with my arm under the pillow anymore! Great product. Best pillow. Thank you. This right here, is a pretty sweet pillow. The package arrived in a timely manner in a legitimate zipper case. Not only do I particularly enjoy the structure of the pillow, I love how it comes with a protective (super mink-like soft) case with a zipper you can remove and clean separately. Yes, it does have an odor to it at first, you just need to wait a day or two to let it air out. FYI- worth the wait. I am a side sleeper and don't like hard pillows. This one is very resilient to pressure yet holds its own for stability. This is a top quality pillow. I have always preferred latex foam pillows but the pact that it is zoned makes it even better. No more neck pain for me! I have struggled finding a pillow that I like let alone love. A friend highly recommended this to me and so I got it. I don't think I can ever go back or I will ever change pillows. The pictures show bare pillow ( but still in manufacturer silky cover) then in the really soft cover it came with then in my pillow case. As a side sleeper I used to have to bunch my pillows but this one is perfect. If I want to sleep on my stomach this pillow flexes enough to be a great fit there as well. One of the things I worried about was some reviews said it had a funny smell. Mine never had a smell. Best pillow I have ever had will never change again. Awesome comfort and durable over time. Cool on the head. Keeps its shape. Worth every penny. I am going to buy another one. I LOVE this pillow! When I saw this latex pillow on Overstock I decided to order it. I have ordered other latex pillows before and they were just blah. But these Talalay natural latex pillows are great!! This pillow was exactly what I wanted. It holds my head and neck in place without flattening out during the night! Love it!! Tried an equally expensive brookstone biosense pillow first and really couldn't get comfortable. This latex pillow is far superior. I fall asleep fast and stay asleep, no neck pain. Just perfect! This pillow is great if you like pillows to be stiffer and more supportive. For me, this one is a little on the high side, but it provides great support if you are sitting at your bed and putting it behind your back. Not only is this a very special and very comfortable pillow, but the service from Overstock.com was incredibly fast and efficient. This is the best pillow we have ever had. Great pillow. Springy and supportive! I’m very disappointed with this pillow! It is so flat maybe an 1” thick and I let it sit for 3 days. Please tell me who I contact to fix this situation? Very soft and comfortable pillow however I did not keep it as the low loft was very low. So if you have a longer neck or sleep on your side, you need a high loft. Wish I had known. It is a very nice pillow and would recommend. I lost my favorite pillow and this was the replacement...very soft...my niece compared it to sleeping on a cloud! This pillow is too soft for a side sleeper, it doesn't support my head and now I have more neck pain than before. Disappointed. Wish the company had a satisfaction trial I would return. I would give this no stars if I could. This pillow is not as represented. It is an absolute joke and I resent having to pay to send it back. I am done with Overstock! I do not have anything good to say about this pillow. This would have been my 3rd latex pillow in 12 years, so I'm not new to latex pillows. I purchased the high loft firm, as the pillows I've had measure up to 6". It is not a high pillow, measuring less than 5" and firm is an understatement. It's like sleeping on a soft rock. Unless you have a long neck, or you like your neck to bend upwards, do not buy the high loft firm. If they weren't so expensive, I'd try the high loft soft, but I'm not going to take the risk. Stick with the cheaper latex options. I’ve been using foam pillows like this for years. They are solid with a good bounce back. Not sinky-in like memory foam. I find that this pillow is the only one that holds my head in a kind of weightless state that allows me the most incredible dreams!!! No joke! Im a side sleeper but back sleeper is great with this too. Best pillow I have used. Holds it shape without adjusting. Just the right amount of give for the neck. I just order another one for the guest room. Love these pillows. Great head support for side sleeping. Well worth the investment. "can anyone tell me if the low firm or high plush is comfy. is the plush soft, does it sink. i saw comments but no one said what kind of pillow they had"
Depending on personal comfort preference, this can be very comfortable. It won’t have the plushness that a down pillow may have. Latex has a bounce-back property so it wont mold to the shape of your head. "Is this pillow memory foam." "Is the bamboo cover removable for washing?" Hello 09buyer, yes the cover is removable. Please let us know if you have any further questions. I want a pillow made of natural material that won't get hot when I sleep. "Is this item 1 each or 2 per?" Hello roostera1, this is for one pillow. Thanks for shopping with us!